Some of Queens’ best food vendors are in the running for prizes at this Saturday’s Vendy Awards, which recognize the tastiest food carts, trucks and market vendors in the city. The 14th annual competition is a fundraiser for the Street Vendor Project, which advocates for vendors rights and provides them with legal and small business expertise. This year’s 25 finalists, which were nominated by the public, will display their most delicious food this Saturday from 12:30 p.m. to 5:00 p.m. on Governors Island. This year, three vendors based in Queens will vie with three other nominees for the top prize— the Vendy Cup. The competitors are among the longest-running food vendors in Queens: Franky’s Souvlaki in Astoria; arepa maker El Sabroso de Aracataca in Jackson Heights; and Burmese Bites in Long Island City. The owner of the Astoria souvlaki truck, Franky Englezos, said that his father started selling hotdogs in an Astoria food truck in 1970, and switched over to souvlaki in 1979. According to Englezos, the truck still serves the recipe invented by his father and grandfather, who worked as butchers in their native Greece. Englezos said that he was “excited” for the competition and thanked longtime fans for nominating his truck. Englezos said that the family’s recipe and commitment to the community has set them apart from other food trucks. “We’re from the community. Customers have been coming to us for years. Whatever we do, we do out of our hearts,” said Englezos. 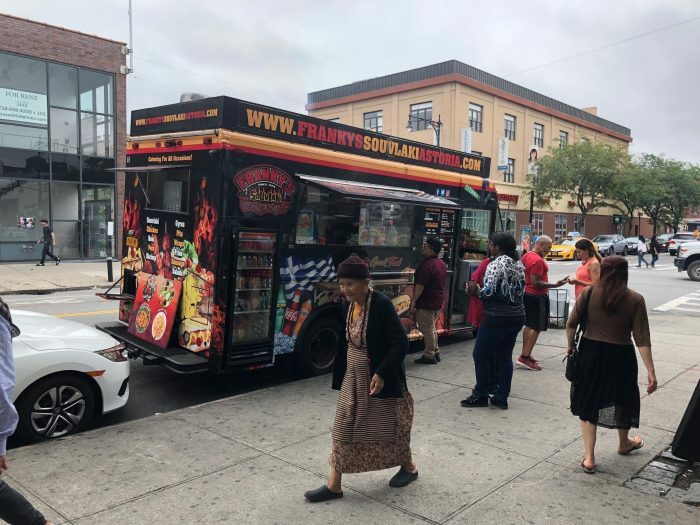 For those who are unable to get to the Vendy’s, Franky’s Souvaki is typically parked at 31-02 Steinway St.
Englezos will face tough opposition from Luis Marin of El Sabroso de Aracataca in Jackson Heights, who has sold arepas near the intersection of Roosevelt Ave. and 80th St. for 30 years. “I feel very good after many years in the streets being invited to the Vendy Awards. It’s very flattering to me. As a Latino I represent all of my Latin people,” Marin said in a video released by the Vendy’s. A third finalist, Myo Lin Thway, has operated Burmese Bites since 2005. The truck, which parks at 5 Court Square West in Long Island City, specializes in Burmese palata— a fried flatbread served with meat. “I’m feel really good to represent Burmese food over here,” said Thway in a video that was also produced for the Vendy’s. Other Queens vendors will compete for the four other Vendy prizes. Evelia’s Tamales Mexicanos, which parks at Junction Boulevard and Roosevelt Avenue in Corona, was nominated for this year’s new award— best breakfast. New vendor Thai food Mr. Khao Man Gai, which parks at 73rd Street on Roosevelt Ave., was nominated for the Vendy rookie award. Two Queens vendors were nominated for an award for the best market-based food vendor: D’Abruzzo NYC and Taste of Surabaya. D’Abruzzo NYC, which is based out of Forest Hills Stadium, specializes in arrosticini— simple skewers made from tender pieces of lamb and served with a homemade spicy oil,—and pizzelles. Taste of Suraya serves Indonesian cuisine at the NY Indonesian Food Bazaar in Woodside. Finally, Delmy’s Obleas was nominated for the Best Dessert. The food vendor sells obleas— South and Central American thin round wafer sandwiches— around Corona. Tickets for the Vendy’s start at $100 for general admission. Tickets are a tax-deductible donation and come with unlimited food and drinks. Tickets for kids from ages 8 to 12 are $60. Franky’s has been destroying the ozone for years with toxic plumes of smoke. Disgusting. ARE YOU STUPID OR WHAT!! Go Franky. I’ve beebeen eating your Souvlakis since you parked on 31st. and Steinway so I know in my heart you’re going to win this year. Your food is GREAT!! You’re a winner in my book. God bless.